Isham Martin is an artist and writer living in Round Pond, Maine. He came to oil painting after many years as a woodcarver and maker of fine furniture and signs. Two of Isham’s sons, Ike and John, were high school and collegiate rowers. Through the years of following his sons' rowing careers, Isham has become a great admirer of the sport, its athletes and scenic beauty. Many of Isham Martin’s paintings have been commissioned by a school, university, or family. An athlete, or parent of an athlete, may ask the artist to capture a particular boat and crew. 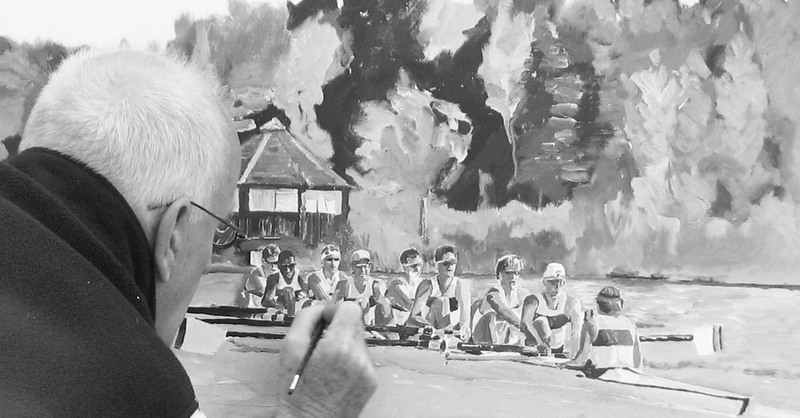 Also, schools and clubs may commission paintings of their boathouses and crews when an original painting or multiple giclée prints will commemorate a special occasion or be useful in a development campaign. Paintings and prints may be commissioned as gifts for graduating seniors or for supportive alumni. On occasion, Isham Martin has created original oil paintings from old photographs. Signed giclée prints are already available for a selection of the paintings shown on our portfolio page.